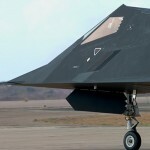 Originally invented in the 70s to give the enemy radar no point of attack, stealth technology provides the basic “triangle” motif for a design trend that only now, 40 years later, has made a stylistic breakthrough. 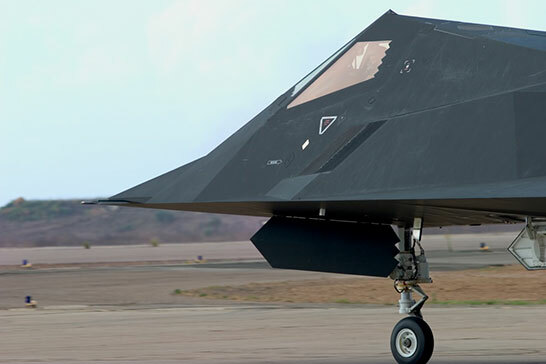 In the summer of 1981, the F117 Nighthawk drove onto the tarmac – the first production product that has been consistently developed using stealth technology. (Actually, no one really believed that this ugly bird could also fly.) The aircraft was the polar opposite of what was imagined by a jet fighter; edged instead of supple, winding instead of smooth. Besides the derivation of stealth technology, there is still a second following: 3D computer graphics. In the 90s, even the leading game consoles did not very naturally represent their animated heroes. Lack of sufficient computing power resulted in round shapes, faces, and moving bodies that rendered edgy and polygonal. As 3D computer technology progressively increased, ever smaller triangles gradually dissolved and eventually disappeared into a “stealthy” appearance. We can finally dare as designers to contribute to the 3D boom in stealth design. 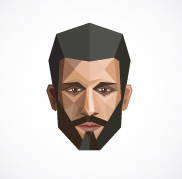 One finds the stealth style today under terms such as faceted, triangular, polygonal, origami, or crystalline. The design principle is simple: a curved body is dissolved in a number of triangles, creating a transitional form between a square and amorphous body. How to apply stealth design? Today, you can see stealth design as a functioning, independent style everywhere that precision, clarity, and improved dynamics are in demand, and minimalist “primitives” have been overused- for example, in smartphones. The HTC TouchPro or Nokia prism of the years 2007/2008 are notable early attempts. Even in furniture and architecture, the style has been tried. 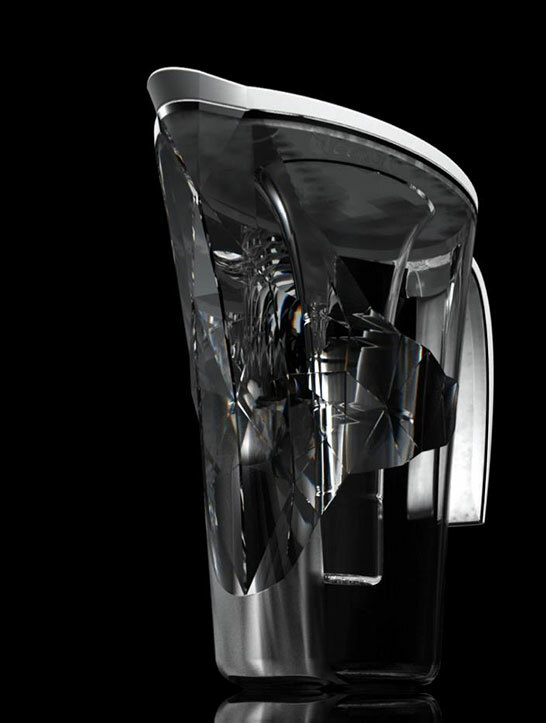 Konstantin Grcic and Zaha Hadid are renowned examples. Currently, Stealth design is likely associated with quality, luxury, trending products, and used in fashion. 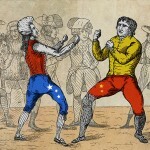 How Will the Style Evolve? In its purest form, Stealth design is an expressive style which makes a stark statement. With this disruptive effect, stealth can draw attention to details without consuming the entire object. It is often combined then with smooth, flowing forms. Using the example of our product design study Wasserkaraffe, one sees that transitions from flowing to crystalline forms are feasible. 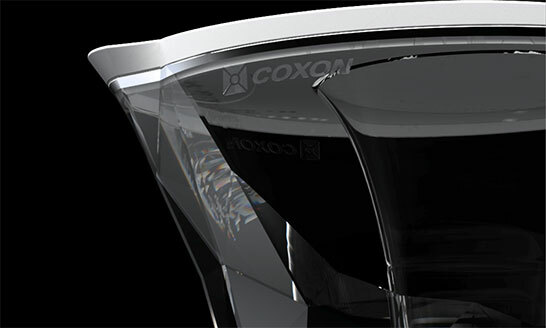 Here the cold, ice cube-like “stealth” is combined with a large and clear, smooth area for pure water. The Design Trend Stealth is a somewhat retro trend, although this form language did not previously exist in the consumer product world. But, visual arts began with Cubism, and the Blue Rider and Kandinsky always found the resolution into triangles exciting. Because early computer graphics were so crude, the style remained quiet for many years. It was all about getting the triangles as small as possible and improving resolution so that they could no longer be distinguished from reality. Today, where every smartphone has this computing power, the rough triangle has thus become socially acceptable again. 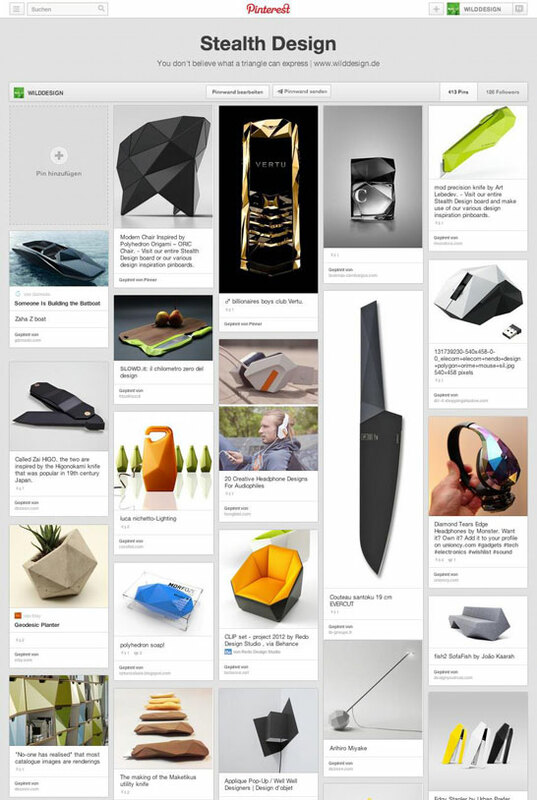 -> Look at stealth design and 13 other exciting design trends in our 2014 review. -> Visit our Pinterest board, where we are adding new daily examples, or share these exciting styles. -> What is a logo design that matches the design trend Stealth Design? What do you think of Stealth Design Trend? Do you know more interesting examples? Let us know your thoughts below.